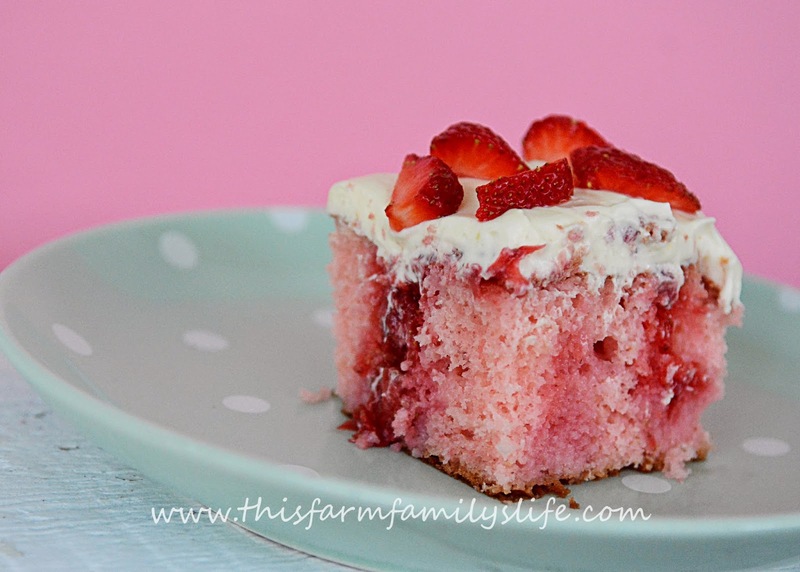 It's still strawberry season in Indiana and I'm sharing this recipe for all of you to enjoy! I made it for the first time a few weeks ago and my husband laughed when I said it was a light and refreshing dessert. He didn't understand how a dessert could be light...and refreshing, but it is! This would be great after any meal...maybe one from the grill! A perfect dessert for summertime! Everyone in our house loved it especially our youngest, but she will eat anything!!! Really though, it is delicious!!! Preheat oven to 350 degrees, Grease a 9x13 baking pan. Prepare, bake and cool cake mix according to directions on package. Once cake is cool, poke holes 1" apart in top (I used a wooden handle from a spoon). Puree thawed strawberries with juice in blender. (I used a potato masher to mash mine). Spoon evenly over top of cake allowing the mixture to soak into the holes. For topping, combine pudding mix and 1 cup milk. Fold whipped topping into pudding mixture. Spread evenly over cake. Garnish with fresh strawberries. Refrigerate at least 4 hours before serving. Keep refrigerated.